The Student Support Services webpage allows parents, teachers and student support personnel to obtain resources and guidance to promote academic and behavioral success for ALL students. The quick links on the left contain website links, scripted interventions, and general resources that address each of the areas listed. 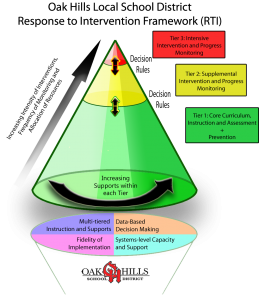 This cone is a visual model of Response to Intervention, which is a systematic approach to providing academic and behavioral services to students in need of additional support. Focus is placed on prevention and early intervention. To find out more about the Response to Intervention Model, please refer to the National Association of School Psychologists’ Parent Guide. Additional resources are available. If you need any additional resources, please contact your child’s school. If you have additional questions regarding Oak Hills student support service, please contact Coordinators of Special Programs, Rachel Searcy at 513-598-2946 or Lis Klotz 513-598-2683. Early Literacy Skills – describes the gradual, ongoing process of learning to understand and use language that begins at birth and continues through the early childhood years. Early literacy skills involve print awareness, alphabetic knowledge, and phonemic awareness. Reading Fluency – is the ability to read accurately, quickly, effortlessly, and with appropriate expression and meaning. Reading Comprehension – is the degree to which we understand what is read. Documents are available for each of these topics. If you need any additional resources, please contact your child’s school. Daly, E.J., Chafouleas, S., Skinner, C.H. Interventions for Reading Problems: Designing and Evaluating Effective Strategies. Guilford: New York, 2005. Gillon, G.T. Phonological Awareness: From Research to Practice (Challenges in Language and Literacy). Guilford, 2007. Harvey, S. and Goudvis, A. Strategies that Work: Teaching Comprehension for Understanding and Engagement. Stenhouse, 2007. Rathvon, N. Effective School Interventions: Strategies for Enhancing Academic Achievement and Social Competence. Guilford: New York, 1999. Spelling – refers to the forming of words with letters in the accepted order. Idea/Topic Development – refers to the use of strategies to generate and refine main ideas prior to writing. Prewriting strategies such as idea webs, story mapping, etc., aid students in topic/idea development. Writing Conventions (grammar, punctuation, etc.) – includes spelling, punctuation, capitalization, grammar, and paragraphing. The writer should use conventions to enhance the readability of the paper. Spelling should be correct on all words. Punctuation should be smooth and guide the reader through the paper. Capitalization should be used correctly. Paragraphing should reinforce organization. Benjamin, C.L. Writing for Kids. Harper and Row, 1985. Sassi, P.A. Better Handwriting in 30 Days. Tarcher, 1989. Forney, M. Razzle Dazzle Writing: Achieving Excellence Through 50 Target Skills. Maupin House, 2001. Kaye, P. Games for Writing: Playful Ways to Help Your Child Learn to Write. Farrar, Straus, and Giroux, 1995. Early Numeracy – describes the understanding of basic numerical concepts and number sense. Early numeracy skills are informal math skills that form the basis for formal skills that are taught in school. Math Fluency – the ability to compute and recall basic math facts with automaticity and confidence. Math Concepts and Reasoning – refers to knowledge of general mathematics problem-solving skills as well as the ability to apply this knowledge in varied settings. Common mathematical domains include number sense, operations, patterns and relationships, data and probability, measurement, data and statistics, geometry, and algebra. Oak Hills partners with Cincinnati Children’s Hospital Medical Center and MindPeace to provide access to school-based community services at Oak Hills High School and our middle schools. For information on these services please contact your child’s school. Luby, J.L. Handbook of Preschool Mental Health. Guilford: New York, 2006. Books from the Adolescent Mental Health Initiative. Poland, S. and McCormick, J.S. Coping with Crisis: Lessons Learned. Sopris West: Colorado, 1999.